Private woodlot owners in western Nova Scotia are likely feeling the pinch from high trucking costs, the loss of the local paper mill and a dwindling market for pulpwood, says the deputy minister of natural resources. Private woodlot owners in western Nova Scotia are likely feeling the pinch from high trucking costs, the loss of a major paper mill five years ago and a dwindling market for pulpwood, says the deputy minister of natural resources. 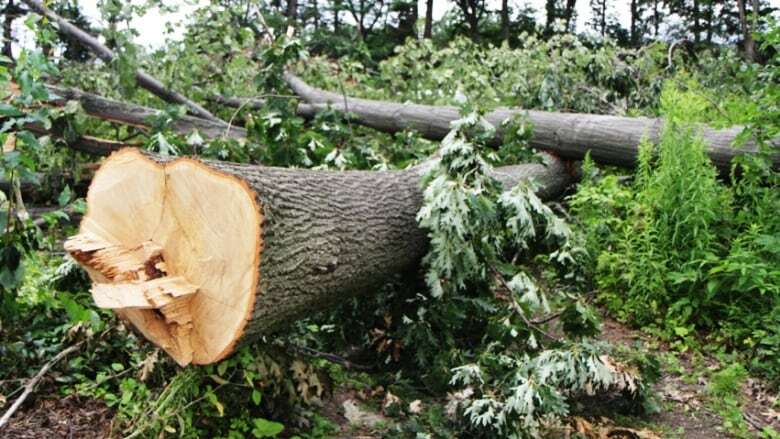 Julie Towers was responding Thursday to concerns raised by some woodlot owners that they are being pushed out of the business because a large consortium of companies is flooding the market with wood logged on western Crown land. Towers said, however, that Nova Scotia forests are being harvested at a level far lower than they could be. Last year, about 3.6 million cubic metres of forest were cut down, out of the seven million the province deemed was available. "After doing all the assessments for protecting water, wildlife habitat, etc., that's the assessment of what could come off, in terms of trees, and we're cutting about half of that," Towers told CBC's Information Morning. Private woodlot owners have argued, however, there's a glut of wood on the market. They blame WestFor, a consortium of 13 forestry companies licensed by the province to operate on western Crown land. The County of Annapolis also wants a moratorium on WestFor clear cutting within its boundaries, but the province has said no. WestFor is in the midst of negotiating a 10-year licence with the province, which is a standard agreement for Crown lands, said Towers. She said in 2016, WestFor cut one million cubic metres of a possible 2.5 million. According to Towers, concerns raised by private woodlot owners in the western region can be attributed to market pressures, including the loss of companies, such as Bowater-Mersey paper mill in Liverpool, and high trucking costs. She said about a quarter of the province's wood supply comes from Crown land, with the rest being produced by private woodlot owners. "It's a product-based issue about too much of that lower grade, particularly pulpwood, and not having markets for it, which is something the provincial government doesn't control but certainly we're looking at the numbers," she said. Towers said her department is working on the scope of an independent forestry review, which could be ready for the public to see in "days to weeks, at most."